Outdoor advertising is perfect for reaching a larger audience on a daily basis. With more people spending less time at home, traditional media like radio, magazines, TV and newspaper’s audience reach is declining. Outdoor advertising provides incredible branding power that can be taken from the street right through to retail points-of-purchase. The Outdoor Media Association states that using a brand icon in an Outdoor advertising space makes it 40% more memorable than not using a brand icon, and no other medium can turn a product or service into a brand as cost-effectively as Outdoor. 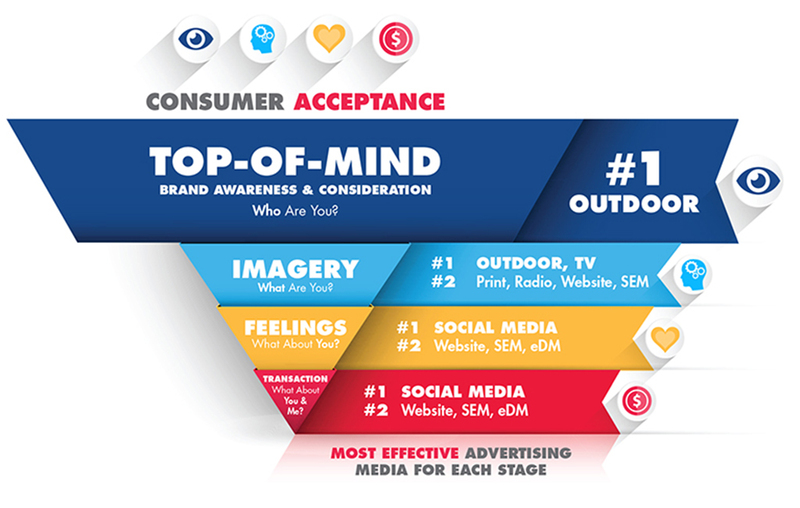 The Bishopp ROI Pyramid illustrates just how powerful billboard advertising can be for brand awareness and consideration. If you are looking for a cost effective advertising solution, consider a billboard and contact Bishopp for the latest information about billboard rates in your area. Billboards are larger than life, big, bold and demand the audience’s attention. Digital application of your artwork allows for unlimited creativity and a professional finish. Most other forms of media place your message alongside other advertisers; with billboards you have a captive audience viewing only your message. Billboards are often the last advertisement viewed before the point of purchase and often give much needed directional aid to travellers entering an unfamiliar area. Billboards regularly provide multiple daily impressions per person every day to strategically compliment your other media exposure. Where other media provides only 30 seconds of exposure, billboards offer long term, 24 hour, 7 days a week message visibility. No matter what the size of business, billboard advertising provides a cost effective solution. Billboard advertising is the last true form of broadcast media. There is no other media with better reach. By using billboards, the commuting population – regardless of their reason for being on the road – becomes your audience.